Did you know, that just a mere $30,000 will buy you the subterranean spiral wine cellar -- of your dreams? It seems rich wine nerds now have a wine cellar. And as the photo above would indicate, these nerds are installing doors in their kitchen floors, that lead to a spiral staircase surrounded by wine. 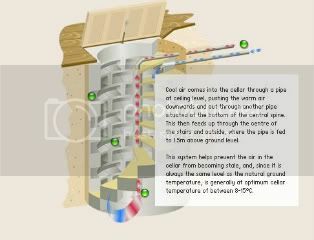 And in addition to being a totally (as well as "certifiably") badass idea as this recent article over at Gizmodo points out, a spiral wine cellar uses the ground to keep bottles at an ideal temperature without needing a whole host of fancy electronics. It saves space and, no doubt, seems it's cost effective to boot. 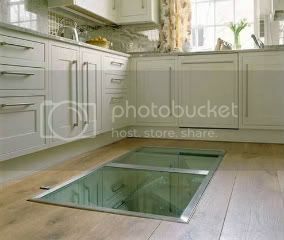 By the way, these Spiral Cellars come in sizes that can hold between 1000 and 1600 bottles. So needless to say, if you've got that many bottles, (along with an extra thirty thou lying around somewhere)...then I say, "Why not?" Hey, let's face it, there's really not a more perfect dish anywhere for a cold winter's days. 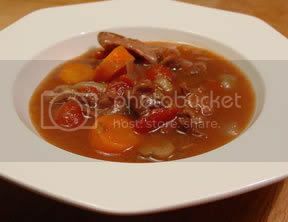 Good, hearty, and satisfying, stew fills your belly and warms you up from the inside out. In heavy, large saucepan over moderately high heat, heat oil until hot but not smoking. Add onion, carrot, and celery and sauté, stirring occasionally, until light golden brown, about 10 minutes. Add beef and sauté, stirring occasionally, until brown on all sides, about 5 minutes. Add wine and thyme, stir well, and bring to boil. Add tomatoes, salt, and pepper, then lower heat to moderately low, cover, and simmer, stirring every 15 minutes, until beef is tender, about 2 hours. Pour olive oil into large serving bowl and swirl to coat. Set aside. In heavy, large pot over moderately high heat, bring stock to boil. Lower heat to moderate and slowly add polenta, stirring constantly. Continue cooking, stirring constantly, until polenta thickens and pulls away from sides of pan, about 10 minutes. Transfer to oil-coated serving bowl and keep warm. When beef is tender, use tongs to remove tomato skins (if desired) and thyme sprigs. Transfer stew to large serving bowl. Serve polenta alongside. Yes, Queen Elizabeth, the Kremlin and the White House have been loyal customers over the years. But in the current economic climate, luxury crystals and ceramics are a tough sell, as Waterford Wedgwood finally admitted on Monday. The company, which is based in Dublin and whose roots go back 250 years, makes and sells crystal vases, glasses, ceramic figurines and kitchenware. Even though, they will probably always be better known for making the world-famous Times Square New Year's Eve ball, as well as the crystal chandeliers that decorate Windsor Castle. 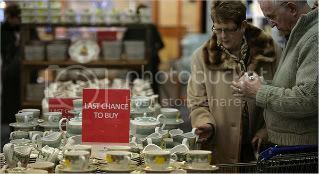 Waterford Wedgwood said on Monday that its 10 British units and 4 businesses in Ireland had been placed into administration, similar to bankruptcy protection in the United States, after running out of money and failing to find a buyer. The remaining subsidiaries, including those in the United States, Germany and Canada, remain unaffected. Good grief, one begs to ask what…or who will be next in this horrendous global economy?? 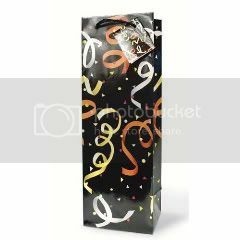 I'm sure we've all seen those often shiny (and not just a little bit cheesily decorated) wine gift bags that are just about everywhere you look as far as liquor stores and retail wine shops are concerned these days. Right? Well, it seems a liquor shop in Rochester, New York, has been fined $10,000 by the New York State Liquor Authority for selling the bags. Not to mention the fact that the State of New York sees nothing wrong with the sale of wine glasses, wine stoppers, and corkscrews in such stores, seeming only to frown upon the sale of these wine "gift" bags. Apparently, according to New York state law, selling gift bags in a liquor store constitutes running a second business, which can be penalized with a hefty fine. The owner of this particular store estimates an overall loss of as much as $20,000 in gift bag sales over the 2008 holiday season. And needless to say, in an awful economy such as the one we're presently in, many of us can truly sympathize. So if anyone from the NYS Liquor Authority happens to be listening, how's about a re-examination of this law, or preferably, an overall "rewriting" of it, guys?